Moores Hill, IN 47032 is less than 1 hour from Cincinnati, a little over an hour from Indianapolis, and about 20 minutes from Batesville, IN. This hunter's paradise is a mixed use residential, recreational, timberland property with a sprawling 216 acres with approx 23 tillable / pasture acres, over half of which will be planted in plots ready for this upcoming season, Use the cabin as a residence or just a place to stay while enjoying all the property offers. The cabin, built in 1992, is a 905 Sq. Ft. cabin with 1 bedroom, 2 bathrooms with a nearly full unfinished basement. 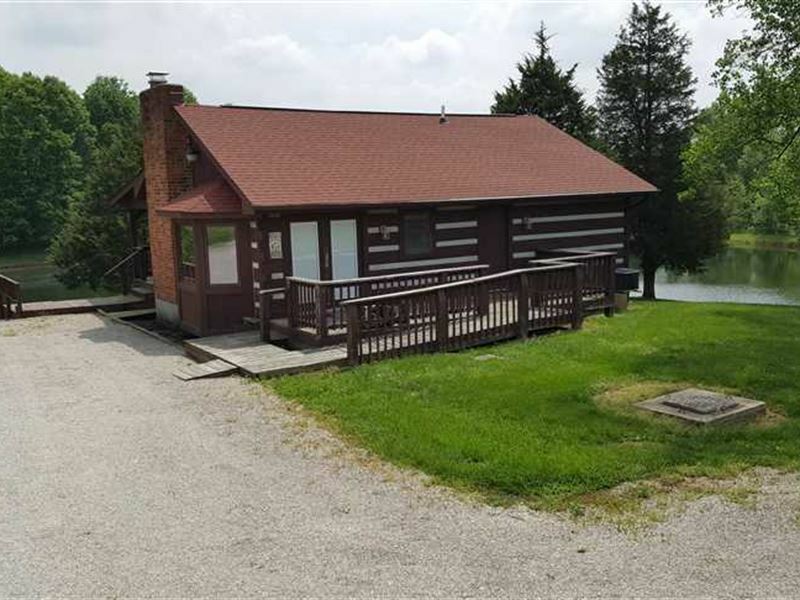 The back deck of the cabin overlooks the 1.5 acre stocked pond with multiple docks on the water and excellent freshwater fishing. There's plenty of room to relax and take in the country living while watching the local wildlife. Turkey and whitetail deer call this farm home and can often be seen from the cabin. This farm is rich with natural browse, and when you add the agriculture and perennial clover food plots, coupled with plenty of thick cover, you have a wildlife sanctuary. The owner's have practiced deer management and have only harvested mature deer over the last several years. There's mast crop producing trees such as White Oak on the property and a nice 10 yr old Oak plantation for future wildlife food or timber. The many small hidden fields aren't ideal for farming however could be brought into production. These fields are currently served as food plots and offers lots of edge where heavy deer browse can be found. The edges of these fields are high in diversity and offers deer many different forms of natural browse. There's a good road system leading you to the back of the property so access isn't an issue. The road could be used as ATV trails, equestrian trails, hiking trails, biking trails, or used for wildlife and bird watching. The property has over 400 ft of road frontage so there's future potential if splitting is desired. A small creek borders the property on the east side and is the boundary. A couple small satellite fishing ponds can be found near the back of the property where waterfowl like duck and geese can often be found. Additional residence and acreage also available. Property subject to survey. This is an absolute wildlife haven and with a outdoorsy cabin, it's a must see. For a private showing call or text Matt Springmeyer at or email Matt at Email listed above.